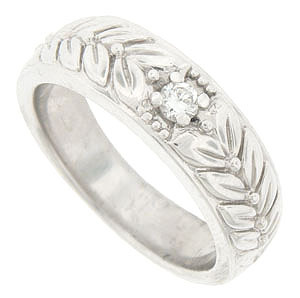 The wide band of this 14K white gold wedding band is engraved with large detailed leaves and berries and set with a .14 carat round faceted diamond. 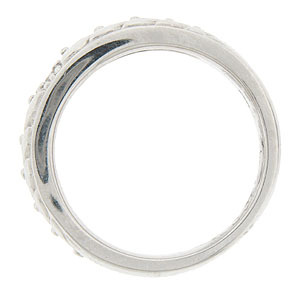 This antique style wedding ring measures 7.48 mm in width. Size 10 1/4. We can re-size or reorder in other sizes. Also available in 18K yellow and white gold or platinum. Actual cost depends on current market value of precious metal used.